“My” Mr. Thurston was one of the earliest snow birds coming to Central Florida. 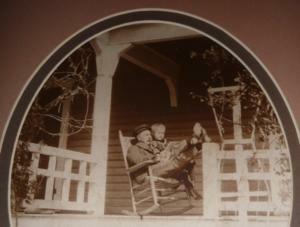 He was a well respected Minnesota businessman, involved in carriages, farm implements and cold storage. When he needed to get away, he came to his home on a 160 acre citrus grove near Maitland, Florida. His home in Florida, although a Queen Anne Victorian style, is more farmhouse than fancy. His home in St. Paul was just the opposite. This 1881 brick mix between a Queen Anne Victorian and Italianate style, now on the historic walking tour, was quite elegant and well suited to his position in the community. Many visitors to Minnesota enjoy this walking tour every year! 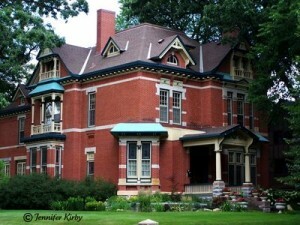 For more about Jennifer Kirby and information about other Minnesota architecture, go to her blog. I now have beautiful mugs made by Deneen Pottery out of St. Paul, Minnesota. They are made one by one using the finest materials and best skilled potters. The coincidence is that “My Mr. Thurston” was from the Twin Cities and was a highly respected businessman in the late 1880’s. His son-in-law was also a highly respected architect and many of the homes and public buildings of the late 1880’s to early 1900’s were designed by him – Clarence Johnston. Anyway, a small world for sure. The mugs from Deneen are beautiful and are offered for sale here too. Many people travel only to inns who carry these mugs. You can find a list of inns who do carry them, listed by state, on their website. Even if you don’t buy one, come to Thurston House and enjoy a cup of coffee or tea from one of the colorful cups on hand.